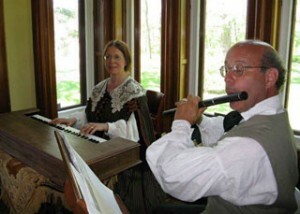 Elite Rabble plays the music of late Georgian and Regency period, from 1760 to 1820, including English Country Dance tunes, nautical tunes and songs, Boccherini , Geminiani and O’Carolan. Elite Rabble especially features the music known and loved by Lord Nelson and the British Naval corps; music both from the captain’s table and below decks. Elite Rabble travels as either a duo (Baroque flute and piano/harpsichord) or as a trio (with the addition of the violin). Musicians: Sherry Ladig, keyboardist/arranger/booking agent; Don Ladig, flute; Rosa Wells, violinist.